See Tesla CEO and founder Elon Musk's entire video presentation here. 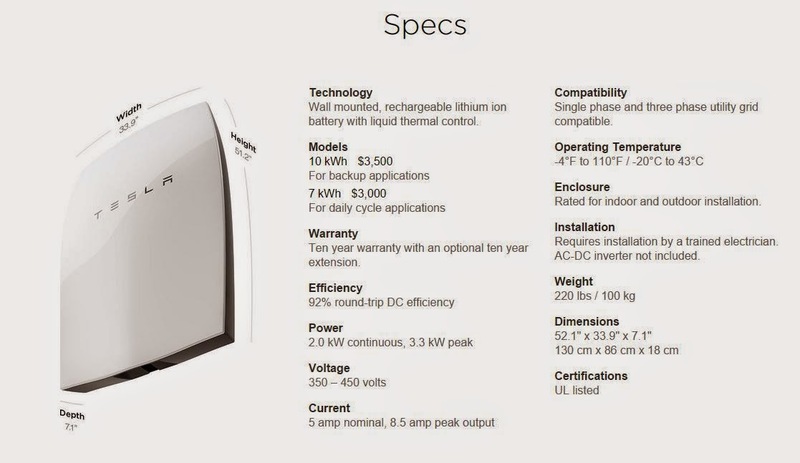 The Powerwall is scalable, meaning that additional batteries can be added to a single system. There are also Powerstacks, an industrial-scale system that can likewise be scaled up by adding additional units. Altogether, these two systems along with Tesla's growing line of electric vehicles, represent an expanding ecosystem of alternatively powered infrastructure. But Tesla's plans don't stop with electric cars and batteries at home. Their Gigafactory (where they will produce batteries) aims at accelerating a complete paradigm shift in energy consumption. The factory will not only produce the batteries driving both their vehicle and home power solutions, but serve as a product in and of itself. Since Tesla seeks not just to build a viable business model, but actual solve the problem of how to transition the planet from fossil fuels to alternatives, it seeks to treat the Gigafactory itself as a product to be sold as a means of expanding battery production globally. It's still too early to tell how Tesla's plans will work out, but the dropping cost and rising capabilities of batteries and solar technology has made it all but inevitable that such a shift will occur from traditional centralized energy sources to decentralized alternative sources. Whatever the outcome of Tesla's plans might be, just by attempting to roll out the Powerwall concept, it will inspire others elsewhere to learn from what Tesla is doing, and take the next steps. Another positive outcome of Tesla's plans and the scale they seek to implement them on is that it will only drive solar and battery technology faster, dropping the prices further, and opening the door to faster innovation across the field of alternative energy. Besides solar power, improved battery technology will further enable a multitude of other alternative energy sources, from wind, to biogas, hydrogen, and other forms yet to be developed. And perhaps the greatest contribution of all regarding Tesla's announcement is that it adds significantly to efforts to break humanity's dependency on antiquated infrastructure. It is an example of how real people can take real measures to change the world through innovation, technology, and daring entrepreneurship. Today, Tesla has made a big splash. Tomorrow, hopefully, others will follow, refusing to accept what is, and making a reality what could be.